Petrarch Sonnet XXXV Music Settings. All three settings of the Petrarch sonnet use the two-part form following Rore's and Willaert's tradition. All of them begin with imitative entrances, using leaps and step-wise motion. Word-painting, a very important feature of the sixteenth century madrigal, is practiced by all three composers in various degrees. Il settimi libro de madrigali a cinque voci-Gardano (Venezia) 1581. Di fuor si legge com’ io dentro avvampi. Sia la mia vita ch’è celata altrui. Ragio ando con meco, ed io con lui? not always come, talking with me, and I with him? Orlando di Lasso "Solo e pensoso"
On the solo (alone) Lasso uses a leap (moving downwards) of a major fifth. On the pensoso (thoughtful) a minor chord accentuates the reflecting mood of the Petrarch sonnet. An upward move of a third on the più (more) in measures 2 and 3 and a leap of a minor sixth used in a very expressive way on the word deserti (deserted) in measures 3 and 4, introduce the word painting that Lasso applies in this madrigal. The other voices enter in imitation with the leap of a fifth (soprano and tenor 2, moving from c to f; Alto, Tenor 1 and Bass moving from g to c). The Soprano enters first again, imitating the passi (steps) with a motive of a rather moderate speed, emphasizing the words tardi and lenti (slow and weary) by slowing down (possibly in semibreve, since the original note values are halved here). The other voices move in the same manner as well. Coming to the words per fuggir’ intenti (to avoid all sign) all voices start moving in short note values, imitating the human uneasiness when trying to avoid something. On uman and la rena stampi beautiful major chords and slower motion accentuate the beauty of the earth element (human, nature) and its steadiness. In measure 23 an interesting harmonic shift through a V-I progression (to B Flat Major) accentuates the words non trove and scampi. In measures 25-26 the movements of the voices (Bass, Alto and Tenor 2) become homophonic, syllabic and quick in a chordal progression of V-I again, moving from G Major to C Major. In measures 27-29, an interesting chord progression of GM-FM-Cm-DM-GM-Cm accentuates an extravagant use of harmony with sudden shifts to major keys and also sudden returns to the key center (in this case Cm). The Soprano, that has been silent during measure 25 (where the Alto, Tenor 2 and Bass were moving in fast steps on the words dal manifesto accorger delle genti), enters now with a beautiful melody on perchè negli atti d’allegrezza spenti; this melody has a rather sorrowful character expressed even more intensively through the E Flat on the word spenti (bereft of all joy). A peaceful character and a progression of IV-V-I (F Major-G Major-C Major), beautiful in its simplicity, serve as an epilogue to the first part (strophes 1 and 2) of the madrigal. The whole setting of the third and fourth verses (measures 36-51) is characterized by a peaceful but somehow sombre mood, moderate motion of the voices in homophonic and syllabic writing with some imitative entrances. The mood overall seems to emphasize peace and unity with nature yet sorrow, resignation and grief prevail. The Soprano, with a leap of a fifth (B Natural-F Sharp) and lovely chromaticism d-e flat-d-f-e (measures 55-56) on the words nè si selvagge, is the only voice that paints in a very expressive way the words "wild" and "harsh;" the other voices continue their motion in more conservative ways, capturing the mood of resignation that dominates the sonnet XXXV of Petrarch. The fourth verse continues in quite the same way as the third until the end and final cadence of the madrigal. Giaches de Wert "Solo e pensoso"
are treated in a moderate motion of all voices moving some on the downbeat and others on the upbeat, thus creating the feeling of the "slow and weary steps." What is striking here is the wide intervals in the opening measures. The Bass carries the whole action of word painting through constant leaps of fifths, sixths, octaves, thirds etc. in a very expressive way. This practice applies more to the beginning while, after the line "Vo misurando...," the role of the Bass is restricted to a "carrying" of the harmony. The voices in the remaining lines of the first two verses display more activity through dotted rhythms, usage of breves, some imitative entrances and beautiful duets towards the end of the first part. The very end of this part is treated homophonically (measures 54-60). where the various voices use either faux bourdon style between them or recite in intervals of thirds, ends the second part. Notice the inconclusive cadence at the end. Luca Marenzio "Solo e pensoso"
The line Egli occhi porto, per fuggir’ intenti is musically interpreted by quicker motion and leaps, giving a more restless impression. Imitative entrances accentuate the character of the word fuggir (avoid). The imitative entrances and calm harmonic progression give to the setting of the verse Ove vestigio uman la rena stampi dignity. On the words altro schermo (other means), a beautiful and calm homophonic progression of c minor-G Major-d minor-A Major introduces the second stanza and the musical character shifts immediately to quicker motion, leaps and melismas with imitative entrances; all this activity paints very well the words non trovo, che mi scampi. Again, peaceful harmonic treatment of the words Dal manifesto accorger delle genti occurs. More motion in a foux-bourdon style (in this case forming intervals of a fourth, between the Canto and Alto, and a third, between Alto and Tenor) takes place while the upper voices repeat several times the line Perchè negli atti d’allegrezza spenti. The Bass sings first the verse Di fuor si legge com’ io dentro avvampi in a very expressive way and in slow motion. By the line Perchè the motion becomes more active and quick. Expressive duets between Canto and Tenor (in dezime, moving downwards), Alto and Bass (also in dezime, moving downwards) and between Canto and Quinto (in sixths, moving upwards) serve as the end of the first part, ending in D Major. A small duet between Alto and Tenor underneath a peaceful and sorrowful melody of the Canto introduces the second part of the madrigal. Imitative entrances on the words e fiume by Quinto, Tenor, Alto and Canto are supported by a slower motion in the Bass that looses up immediately into melismas, imitated by other voices (Canto and Tenor). The Bass continues to support the voices that move in duets by a slower speed and dignity in character on the words sappian’ di che tempreSia la mia vita. On the line Ma pur si aspre vie nè si selvagge the harmonic progressions are relatively conservative. The only word painting of the "wild, harsh ways" is achieved through suspensions and slow motion. The last two lines of the second stanza are treated with imitative writing-a peaceful duet (in the interval of a dezime between Canto and Bass) leading into the very end, again treated in duets. Petrarch Sonnet XXXV Music Settings: The Madrigals by Orlando di Lasso, Giaches de Wert and Luca Marenzio. A Comparison. All three settings of the Petrarchan sonnet use the two-part form following Rore's and Willaert's tradition. All of them begin with imitative entrances, using leaps and step-wise motion trying to imitate the character of the words. Word painting, a very important feature of the sixteenth century madrigal, is practiced by all three composers in various degrees. Lasso's madrigal, composed in 1557, is the oldest of the three. Lasso, after having lived in Italy and Netherlands, was called to the court of Albert V, Duke of Bavaria, in 1556. He wrote this madrigal a year after this event. 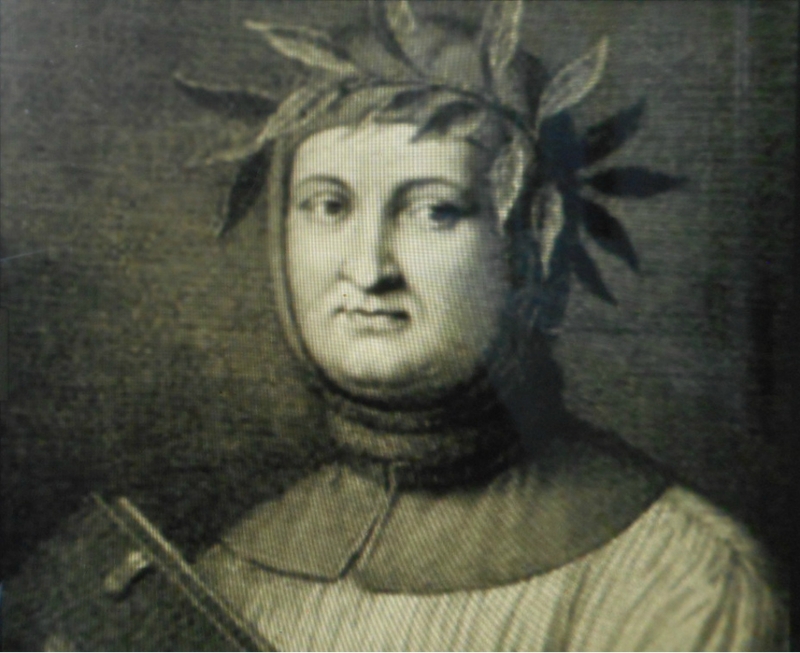 The composer had already gone through his youth experiments in chromaticism (in his Prophetiae Sibyllarum) and was not yet touched by the depression of his later years (as expressed in his Lagrime di San Pietro). This madrigal may be considered as one of his mature compositions, well balanced in its use of chromaticism, contrapuntal writing and word painting. Lasso believed that music should heighten and paint the meaning of the text. In that he differs very much from Palestrina and leans toward the tradition of Rore and Willaert, going even back to the origins of the madrigal: the balance between imitative counterpoint and chordal writing as used in the sixteenth century motet. The experiments around the 1550s (Willaert's circle, de Rore and Vicentino) are evident here, far more than in de Wert's and Marenzio's madrigals. Lasso uses short motives generated by the words and treated in a syllabic, not melismatic, way. The character of music is determined by the meaning of the text and lacks the long melodic lines used by Palestrina. Intense composing, by free contrapuntal writing and quite innovative use of harmonic progressions together with some chromatic elements, makes this example one of the most interesting of all three. Giaches de Wert. Around the 1570s, the hybrid style of the madrigal was developed. The composers that influenced this style were Andrea Gabrieli and Giovanni Ferretti: madrigalisms (quick turns or runs to imitate happiness, slow motion and low tesitura to imitate rest or sleep) as well as Scheinpolyphonie (sham polyphony, or the impression of having more homophonic than polyphonic texture) begin to play a particular role. The entrances of voices are still imitative but there is a clear harmonic context. Gabrieli's influence can be observed at the transparent textures and bright colours (through the frequent use of the major triad). By the 1580s, a more florid style is developed with wide-ranging and technically demanding ornamentation. Highly qualified singers are brought to various courts, beginning with the court of the Duke of Ferrara. The voices move in (madrigalisms) long melismas but also in intervals of thirds, in the so-called faux-bourdon style. Giaches de Wert's madrigals written between 1580 and 1595 can be divided into two categories: the expressionistic and the recitational madrigals. The dramatic elements of de Wert's style find a beautiful outlet in his expressionistic madrigals, using extravagant musical gestures (like unusual intervals such as tritones, 7ths, 9ths and 10ths), high or low tessitura and contrasts in tempo. On the other hand, the recitational madrigal simplifies the musical texture to the extreme: no evident chromaticism, dissonance or polyphony are allowed. The chordal texture has purely declamatory purpose. This madrigal by de Wert, written in 1581, shows evidence of almost all of the above discussed styles: the expressionistic style of the 1580s can be observed right in the beginning, in measures 1-12. The Scheinpolyphonie of the 1570s prevails here; on the other hand, madrigalisms and faux bourdon style are also present (1st part: measures 48-62, 2nd part: measures 3-8) as well as the declamatory style of the recitational madrigal (2nd part: measures 15-28). It is difficult to define the style of this madrigal: richness of various stylistic elements give to it an unusual and very individual character. Luca Marenzio's setting, composed in 1599, is a typical example of the new type of madrigal as it appeared around the 1590s. Marenzio, Luzzaschi and Gesualdo were the main composers of that later style. The writing becomes less concerned with contrapuntal devices but grows in emotional intensity. The new philosophy is: the text must be master of the music, leading to Monteverdi's 'seconda prattica.' There is more freedom in writing while this new style shares some features with the madrigal of the 1580s: both require professional singers by displaying a highly developed virtuosity and other avant-garde tendencies. This particular madrigal was composed in the year of Marenzio's death, thus earning the title of a very mature work. Marenzio was a master of pictorialism, painting musically almost every word: the result of this practice is a composition broken into several segments. This example though, shows more of the mature features of his later madrigals: continuous flow, richness in expressive means, and chromaticism (not used in his earlier works) are all perfectly balanced within a superbly supported overall structure.